especially when it gives you a glowing complexion. That’s why I’m into EmerginC Scientific Organics. This is a paraben free, petro chemical free, synthetic fragrance-free, skincare line. This 100% natural line uses botanicals, and marine extracts to deliver results. To name a few- grape stem cells, spirulina, kombucha. goji berry, white and green teas, food grade seaweed, aloe, and pine bark extract. 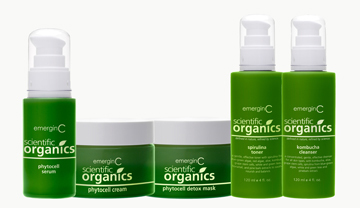 For every retail-size emerginC scientific organics product sold, emerginC will plant a tree. I have been using their Kombucha cleanser. It is a gentle, effective, cleanser for all skin types. It will brighten your complexion while ridding it of any environmental pollutants, excess oil, and makeup. I also like the Phytocell detox mask. It is a french green clay based mask designed to draw out impurities, nourish, and soothe the skin. So brighten your complexion with Scientific Organics, and share the knowledge ….